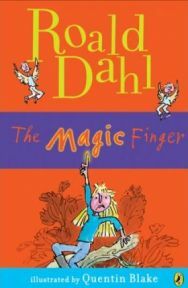 The main characters are the girl, Phillip Gregg, William Gregg, Mr and Mrs Gregg and the magic finger. What happens is that when the girl gets angry she points her finger at anyone that is making her angry or humiliating her and puff something bad happens. For example her teacher Miss Winter asked her to spell cat and she said “that’s easy K-A-T” and her teacher got all angry and she pointed the MAGIC FINGER at her teacher and amazingly she grew whiskers and sprouted a tail. I would recommend this book to other people aged 4-7 because it has got lots of action and adventure on the go and smaller children can’t read it but their teachers could to them. My favourite part is when the Gregg family turned into birds and they had to eat worms. Roald Dahl is an excellent writer. I’ve read all the books and I don’t think this one is his best but that is just my opinion. No Comments on "Magic Finger"